In 2008, Joseph D’Lacey published his first novel Meat. He wrote his heart and soul into it. Its success established him at the forefront of the Eco-Horror genre and prompted Stephen King to declare that “Joseph D’Lacey rocks!” And it introduced readers to Joseph D’Lacey’s great theme, from which he’s never wavered: the damage mankind’s greed and ignorance inflict upon Mother Earth, and the resulting cataclysm when Mother Earth strikes back. For a while it seemed that Meat was D’Lacey at his peak, that he would not produce a better expression of his imagination. We didn’t see a full-length novel from him after 2009’s Garbage Man, about a landfill that spawns trash-monsters. Then came 2012, and Blood Fugue, which proved D’Lacey’s imagination still packed a gut-punch or two. But, for all I enjoyed that novel, it didn’t come from the same aesthetic space as Meat. Well, Black Feathers does. No—I’ll go one further. I get the feeling Black Feathers is the work Joseph D’Lacey has been building toward since he first faced a blank page with the intention of telling a story. It outdoes Meat in ambition, scope, poetry, vision, mythic resonance, depth, and execution. Quite simply, Black Feathers shows that Joseph D’Lacey has matured. The story’s structure is a dual-narrative. The first strand is set in the near-future and follows Gordon Black, a young boy whose family survives an environmental apocalypse that turns what remains of English society into a police-state run by a quasi-military organization called The Ward. Almost all of this happens off-stage and is delivered via standard exposition. I could have used less of this second-hand information, and would have preferred to be more immersed in the sheer drama of the civilization’s collapse. I understand, though, that D’Lacey has a big story to tell, and cannot afford the hundreds of pages it would have cost him to detail this catastrophe in all its glory. And perhaps he was wise not to try. No one’s going to beat Stephen King’s The Stand at that game. Anyway, D’Lacey’s overall concern is not the fall. It’s the aftermath. Specifically, it is the emergence of the character who provides the novel with its mythic heart—The Crowman. The folklore surrounding this mysterious figure, also known as The Scarecrow and Black Jack, evokes both fear and wonder. Some say his coming heralds the end of mankind. For Gordon, to find The Crowman would be to save his family, and to heal the Earth. If only he can avoid capture by The Ward. The novel’s second thread, interwoven with the first, is set in the far future. Humanity has recovered, and now lives a kind of pastoral idyll in the green and pleasant medieval landscape that has colored the imaginations of fantasy writers from Tolkien onward, except that hidden away in this landscape are the wastelands of dead cities, where—so the old stories claim—great illuminated towers once stood, and strange machines with lights on the front used to zoom people around at terrific speeds. The passages in this strand are written in present-tense. They are the novel’s Now. Here, we meet Megan. She is about the same age as Gordon, and she also must pursue the elusive Crowman. He has appeared to her, chosen her for the Dark Feathered path under the tutelage of a wandering healer/shaman called Mr Keeper. Megan, too, is to become such a keeper. It is prophesied that the first and only female keeper will be the last keeper. Is Megan the one? I think so. But does this mean salvation or destruction? Much of this thread concerns Megan’s training, and the wisdom Mr Keeper is able to impart to her along the way. But it is also in this thread that D’Lacey explores his other major theme. While, overall, Black Feathers enhances D’Lacey’s grand idea concerning mankind’s responsibilities to Mother Earth, Megan’s thread also examines the vital importance of the art of story-telling. Mr Keeper presents Megan with a book full of blank pages. In it, she must write the Crowman’s story, as revealed to her in dreams that can strike her at any time of the day or night. This is what Keepers do. They keep The Crowman’s story. For as long as The Crowman’s story is kept, the Earth will stay strong. So keepers through the generations have set The Crowman’s story down afresh in whatever ways The Crowman has seen fit to relate it. Here is where the sacred impinges the profane, where the eternal jolts the passing, and the fantastic touches the everyday. This is the well-spring of inspiration, the deep source of all art. Is D’Lacey saying our greatest inspiration comes from our deep connection with nature? Or is that too simple? What, after all, does The Crowman represent? And how intimately would one wish to be connected to him? One may as well ask what, in Melville’s great novel, does the white whale represent? We know that too intimate a connection with that beast means death, though the novel’s narrator, Ishmael, also on the fated Pequod, undergoes a process of rebirth and salvation. D’Lacey has served up his most delectable treat yet with this novel. He deftly weaves together its two narrative strands, having Megan’s feet at times tread the same ground as Gordon’s, only far into the future. Both are at times in peril, and subject to mysterious people and powers, so the pace rarely lags. But Megan and Gordon never come together, though I anticipate they will. The Crowman can, after all, manipulate The Weave, which is the intertwining of the events of time, so his keepers can travel back and forth along its warp and weft. At one point, for example, Megan, as one of a murder of crows, witnesses Gordon’s birth, and we get to see the event from both sides. But I’m banking these dual protagonists will come much closer together than that. To what end remains a mystery. 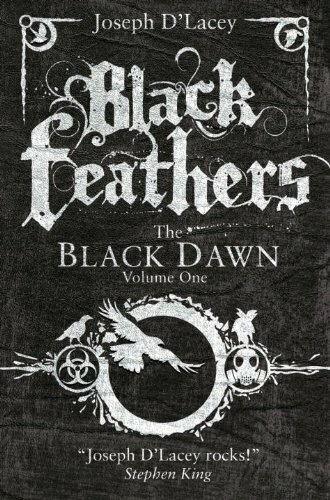 Since Black Feathers is only the first half of the story, I will have to wait for final volume to find out. Posted on February 10, 2013, in Book Reviews. Bookmark the permalink. 2 Comments. Very well-written review. I haven’t read any D’Lacey but this gives me a real sense of his work and style.